The global cosmetic jars packaging market has grown at a rapid pace in recent years due to the steady growth witnessed by the cosmetics sector. The cosmetics sector has been boosted by the growing demand for cosmetic formulations for maintaining a younger and more attractive appearance as well as protecting from growing pollution. Cosmetic jars packaging has become an increasingly important part of the global cosmetics sector due to growing realization of its utility in brand endorsement and consumer outreach. The global cosmetic jars packaging market is thus likely to exhibit steady growth in the coming years, aided by the growing demand for cosmetic products in the affluent middle class in emerging countries. The global cosmetic jars packaging market is expected to reach a value of more than US$5 bn by 2022, exhibiting a 5.1% CAGR from 2017 to 2022. The global cosmetic jars packaging market is likely to reach a valuation of US$3.9 bn by the end of 2017. By capacity, the global cosmetic jars packaging market is segmented into below 50 ml, 50 ml – 100 ml, 100 ml – 150 ml, 150 ml – 200 ml, and above 150 ml – 200 ml. The below 50 ml category is likely to dominate the global cosmetic jars packaging market due to the steady demand for smaller containers in the FMCG sector. The below 50 ml category represents 52.4% of the global cosmetic jars packaging market in 2017, with a valuation of more than US$2 bn. The segment is expected to exhibit a 4.6% CAGR over the 2017-2022 forecast period to reach a valuation of US$2.5 bn. Geographically, Asia Pacific except Japan is the major contributor to the global cosmetic jars packaging market and is likely to be valued at close to twice that of the North America market by 2022. The Asia Pacific except Japan cosmetic jars packaging market’s 6.6% CAGR over the 2017-2022 forecast period is likely to ensure its position in the coming years as the most attractive market for cosmetic jars packaging players. By material, plastics are currently the leading segment of the global cosmetic jars packaging market due to their convenience in producing various shapes. The cheap costs of plastics, especially compared to alternatives such as wood, metal, and glass, have also played a key role in ensuring the dominance of the plastics segment in the cosmetic jars packaging market. Glass packaging is likely to emerge as a significant segment of the global cosmetic jars packaging market in the coming years due to the increasing demand for novelty packaging in the market. The global cosmetics jars packaging market is moderately consolidated but extremely competitive. The immense commercial scope of the cosmetic jars packaging market is likely to ensure growing investment from leading cosmetics sector players in the coming years. The major players in the cosmetics jars packaging market are likely to focus on consistent product development in the coming years as their key strategy, as maintaining a wide array of products has emerged as an important part of the winning strategy to succeed in the cosmetics jars packaging market. Leading players in the global cosmetic jars packaging market include RPC Group Plc, Albea SA, Gerresheimer AG, Libo Cosmetics Company Ltd., Quadpack Industries, HCP Packaging, P. W. Masterchem S.J., Raepak Ltd., Akey Group LLC, and Bonex d.o.o. 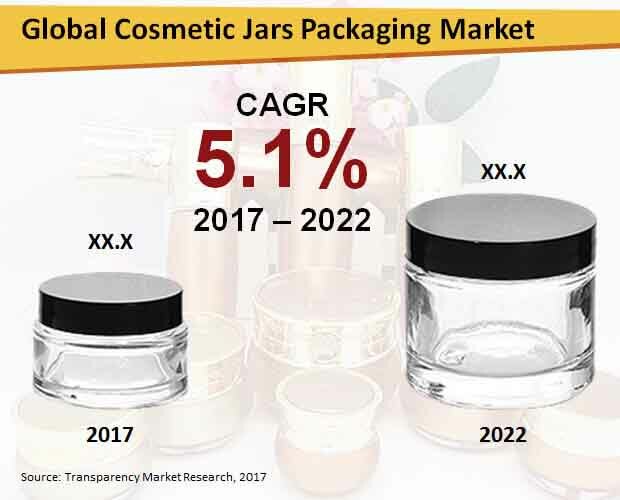 The global cosmetic jars packaging market report provides a close look at the growth trajectory exhibited by the cosmetic jars packaging market within the context of the rapid growth of the cosmetics sector in recent years. The report provides a complete picture of the global cosmetic jars packaging market’s growth trajectory and growth potential in the coming years. The historical trajectory of the global cosmetic jars packaging market from 2012 to 2017 is studied by analysts to form a solid database for the cosmetic jars packaging market in 2017. This factsheet is used to compile detailed reliable forecasts regarding the global cosmetic jars packaging market’s growth potential from 2017 to 2022. The report thus provides a comprehensive study of the global cosmetic jars packaging market. According to Transparency Market Research, the global cosmetic jars packaging market is likely to be valued at more than US$3.9 bn by the end of 2017. The market’s solid 5.1% CAGR between 2017 and 2022 is expected to enable a strong surge to more than US$5 bn over the forecast period. The cosmetics sector has thrived in recent years due to the rising preference to cosmetic products to both maintain a more attractive appearance and protect from pollution. This has driven a widespread network of industries, including the cosmetic jars packaging market. The report provides a detailed look at the various factors affecting the growth of the global cosmetic jars packaging market in the coming years and provides solid information on the quantitative effect these factors are likely to have on the growth of the cosmetic jars packaging market. The key restraints holding the cosmetic jars packaging market back are also examined in the report to advice readers on what to stay away from in the market in the coming years. This comprises a crucial part of the cosmetic jars packaging market report intended to provide readers with precise insight into the dynamics powering the trajectory of the market. The report segments the global cosmetic jars packaging market by material, capacity, and application in order to obtain a clear picture of the standing of various products in the market. Leading segments of the cosmetic jars packaging market are studied in the report to understand their growth trajectory in recent years. By capacity, the report looks at below 50 ml, 50 ml – 100 ml, 100 ml – 150 ml, 150 ml – 200 ml, and above 150 ml – 200 ml categories. By application, the report segments the global cosmetic jars packaging market into skin care, nail care, hair care, and makeup. The key materials used in the production of cosmetic jars packaging include plastic, metal, glass, and wood. The report provides a clear picture of the growth prospects of these key segments of the cosmetic jars packaging market in the 2017-2022 forecast period. The global cosmetic jars packaging market is likely to be congested in the coming years due to its increasing value to the burgeoning cosmetics sector. The growing investment in packaging and design applications in the cosmetics sector is likely to ensure entry of new entrants in the cosmetic jars packaging market as well as steady growth of existing leading players.